The time it takes for a single parent atom to decay to an atom of its daughter isotope can vary widely, not only between different parent-daughter pairs, but also randomly between identical pairings of parent and daughter isotopes. The decay of each single atom occurs spontaneously, and the decay of an initial population of identical atoms over time t, follows a decaying exponential distribution, e−λt, where λ is called a decay constant. One of the properties of an isotope is its half-life, the time by which half of an initial number of identical parent radioisotopes have decayed to their daughters, which is inversely related to λ. Half-lives have been determined in laboratories for many radioisotopes (or radionuclides). These can range from nearly instantaneous to as much as 1019 years or more. The intermediate stages each emit the same amount of radioactivity as the original radioisotope (i.e. there is a one-to-one relationship between the numbers of decays in successive stages) but each stage releases a different quantity of energy. If and when equilibrium is achieved, each successive daughter isotope is present in direct proportion to its half-life; but since its activity is inversely proportional to its half-life, each nuclide in the decay chain finally contributes as many individual transformations as the head of the chain, though not the same energy. For example, uranium-238 is weakly radioactive, but pitchblende, a uranium ore, is 13 times more radioactive than the pure uranium metal because of the radium and other daughter isotopes it contains. Not only are unstable radium isotopes significant radioactivity emitters, but as the next stage in the decay chain they also generate radon, a heavy, inert, naturally occurring radioactive gas. Rock containing thorium and/or uranium (such as some granites) emits radon gas that can accumulate in enclosed places such as basements or underground mines. 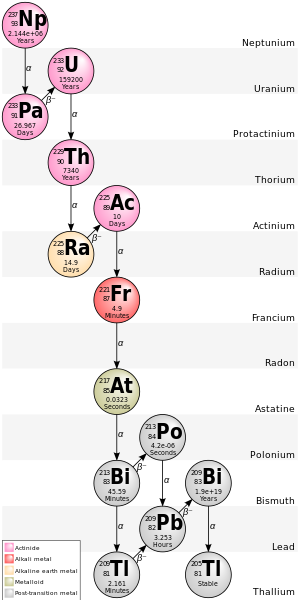 All the elements and isotopes found on Earth, with the exceptions of hydrogen, deuterium, helium, helium-3, and perhaps trace amounts of stable lithium and beryllium isotopes which were created in the Big Bang, were created by the s-process or the r-process in stars, and for those to be today a part of the Earth, must have been created not later than 4.5 billion years ago. All the elements created more than 4.5 billion years ago are termed primordial, meaning they were generated by the universe's stellar processes. At the time when they were created, those that were unstable began decaying immediately. All the isotopes which have half-lives less than 100 million years have been reduced to 6988280000000000000♠2.8×10−12% or less of whatever original amounts were created and captured by Earth's accretion; they are of trace quantity today, or have decayed away altogether. There are only two other methods to create isotopes: artificially, inside a man-made (or perhaps a natural) reactor, or through decay of a parent isotopic species, the process known as the decay chain. Three of those chains have a long-lived isotope (or nuclide) near the top; this long-lived isotope is a bottleneck in the process through which the chain flows very slowly, and keeps the chain below them "alive" with flow. The three long-lived nuclides are uranium-238 (half-life=4.5 billion years), uranium-235 (half-life=700 million years) and thorium-232 (half-life=14 billion years). The fourth chain has no such long lasting bottleneck isotope, so almost all of the isotopes in that chain have long since decayed down to very near the stability at the bottom. Near the end of that chain is bismuth-209, which was long thought to be stable. Recently, however, bismuth-209 was found to be unstable with a half-life of 19 billion billion years; it is the last step before stable thallium-205. In the distant past, around the time that the solar system formed, there were more kinds of unstable high-weight isotopes available, and the four chains were longer with isotopes that have since decayed away. Today we have manufactured extinct isotopes, which again take their former places: plutonium-239, the nuclear bomb fuel, as the major example has a half-life of "only" 24,500 years, and decays by alpha emission into uranium-235. In particular, we have through the large-scale production of neptunium-237 successfully resurrected the hitherto extinct fourth chain. Due to the relatively short half-life of its starting isotope neptunium-237 (2.14 million years), the fourth chain, the neptunium series with A = 4n + 1, is already extinct in nature, except for the final rate-limiting step, decay of bismuth-209. The ending isotope of this chain is now known to be thallium-205. Some older sources give the final isotope as bismuth-209, but it was recently discovered that it is very slightly radioactive, with a half-life of 7026599594400000000♠1.9×1019 years. There are also non-transuranic decay chains of unstable isotopes of light elements, for example those of magnesium-28 and chlorine-39. On Earth, most of the starting isotopes of these chains before 1945 were generated by cosmic radiation. Since 1945, the testing and use of nuclear weapons has also released numerous radioactive fission products. Almost all such isotopes decay by either β− or β+ decay modes, changing from one element to another without changing atomic mass. These later daughter products, being closer to stability, generally have longer half-lives until they finally decay into stability. The 4n chain of Th-232 is commonly called the "thorium series" or "thorium cascade". Beginning with naturally occurring thorium-232, this series includes the following elements: actinium, bismuth, lead, polonium, radium, radon and thallium. All are present, at least transiently, in any natural thorium-containing sample, whether metal, compound, or mineral. The series terminates with lead-208. The 4n + 1 chain of Np-237 is commonly called the "neptunium series" or "neptunium cascade". In this series, only two of the isotopes involved are found naturally, namely the final two: bismuth-209 and thallium-205. A smoke detector containing an americium-241 ionization chamber accumulates a significant amount of neptunium-237 as its americium decays; the following elements are also present in it, at least transiently, as decay products of the neptunium: actinium, astatine, bismuth, francium, lead, polonium, protactinium, radium, thallium, thorium, and uranium. Since this series was only studied more recently[when? ], its nuclides do not have historic names. One unique trait of this decay chain is that it does not include the noble-gas radon, and thus does not migrate through rock nearly as much as the other three decay chains. The 4n+2 chain of U-238 is called the "uranium series" or "radium series". Beginning with naturally occurring uranium-238, this series includes the following elements: astatine, bismuth, lead, polonium, protactinium, radium, radon, thallium, and thorium. All are present, at least transiently, in any natural uranium-containing sample, whether metal, compound, or mineral. The series terminates with lead-206. ^ Trenn, Thaddeus J. (1978). "Thoruranium (U-236) as the extinct natural parent of thorium: The premature falsification of an essentially correct theory". Annals of Science. 35 (6): 581–97. doi:10.1080/00033797800200441. ^ Thoennessen, M. (2016). The Discovery of Isotopes: A Complete Compilation. Springer. p. 19. doi:10.1007/978-3-319-31763-2. ISBN 978-3-319-31761-8. LCCN 2016935977. C.M. Lederer; J.M. Hollander; I. Perlman (1968). Table of Isotopes (6th ed.). New York: John Wiley & Sons. Wikimedia Commons has media related to Decay chain.